As a solids control equipment decanter centrifuge manufacturer, KOSUN supply other solids control equipment for sale, including shale shaker, shale shaker screen, desander, desilter, vacuum degasser, 3 Phase decanter centrifuge , centrifugal pump, submersible slurry pump, shear pump, mud agitator, mud gun, drilling fluid mud cleaner, decanter centrifuge, mud tank, diesel tank, water tank, complete solids control system, etc. Kosun 3 Phase Decanter Centrifuge Typical Applications:Oil sludge treatment, animal/plant fat & oil extraction, starch & vital gluten separation, fish oil, albumen and fish meal separation in fish oil field. 3 Phase Decanter Centrifuge can be used in following cleaning, solid remove and impurity remove 3 phase separation field: tar, pesticide, oil filed recovered oil, used oil, waste oil & fat from restaurant, palm oil, oil tank cleaning, oil refining sludge, oil station cleaning sludge, olive oil, orange oil, gas floating sludge, food waste sludge. 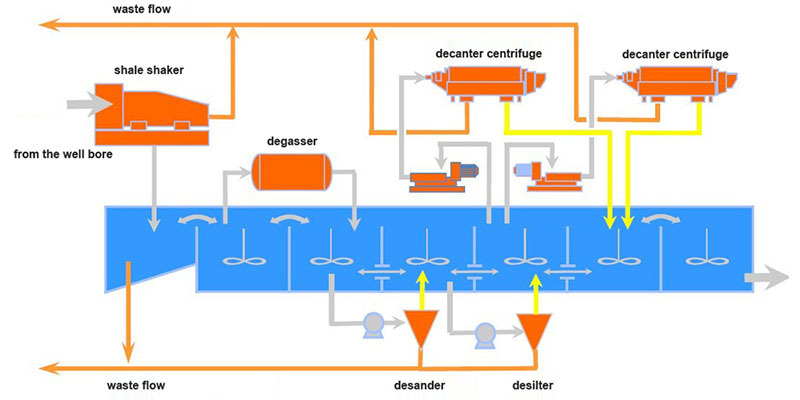 Similar with 2 phase decanter centrifuge operation principle, under the centrifugal force the feeding material can be divided into three relative stable layers. From the bowl inside wall there will be solids phase layer, heavy liquid phase and light liquid phase. The solids phase layer is pushed to bowl small-end part by conveyor and discharged from solid outlet. The heavy liquid phase and light liquid phase are delivered to bowl big-end part and discharged separately from two different outlets. It can reach three-phase separation. 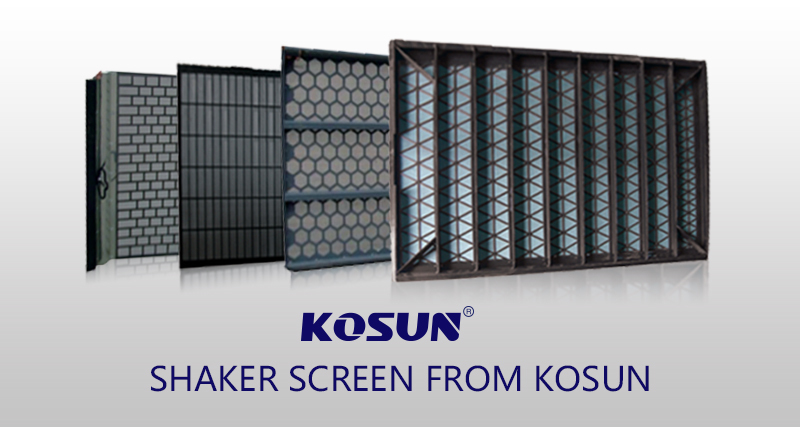 Kosun solids control undertakes equipment selection, design and manufacturing according to material data and actual demands of users. We warmly welcome users to visit our Company for field investigation, technical exchange and long-term cooperation. What’s the Solid Control System consist of? Kosun as the professional solid control system manufacturer, we have our own understanding about this system.In Kosun’s words, solid control system is also called drilling fluids purification system, primarily applied for solids control and solid-fluid separation in drilling fluids so that the drilling mud might be recycled. Consisted of 3-7 module composite tanks and configured with 4 phases of purification equipment, it is fit for 2000-7000 meter oil drilling processes. The whole system is innovative with the bottoms of its purification tanks made to be conical and its edges equipped with mud agitating system to prevent solids from depositing. The first main equipment for solid control system should be the vacuum degasser,We could analytics from the function of vacuum degasser. Generally speaking, horizontal vacuum degasser will be used to separate the gas from the drilling solids. What’s the reason to do like that? Because we should do everything to prevent any dangerous elements in oil & gas drilling fields. That’s why we should put the vacuum degasser as the first role. The second one should be mud cleaner. 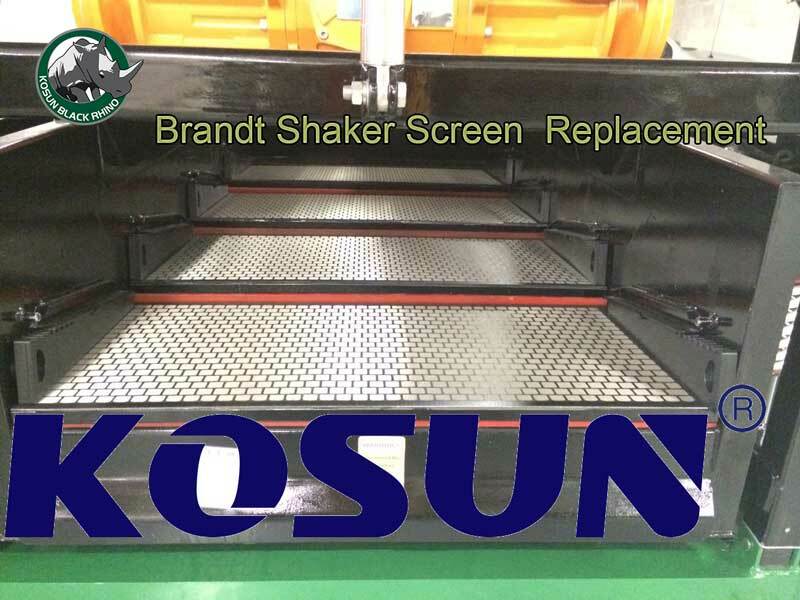 KOSUN MD Series Mud Cleaner is the second stage separation equipment for drilling fluids, which deals with the mud being treated by the first grade separation equipment. The barite will be recovered and cuttings which are bigger than barite will be removed. Then the barite in the underflow will flow into circulation tanks through the screens when the weighted mud passes while the particles that are bigger than mesh will be removed. The third equipment, we think it should be shale shaker (with necessary steel frame shaker screen). Actually, after the drilling solids have been transported and fed into vacuum degasser and mud cleaner, the third step is going with shale shaker. Commonly, we still need to be transported the solids onto the shale shaker, or we could say onto the surface of shaker screen. The equipment of transporting we should use is centrifugal sand pump or screw pump; and we may use shear pump to cut the drilling solids into small one if they are in big size. With the different design of the shaker screen’s mesh, we could get the drilling solids separated in different sizes. The fourth equipment should be the decanter centrifuge. KOSUN DC Series Decanter Centrifuge is used to separate suspended solids ≥2μm in diameter and treat the drilling mud and fluids. It is especially effective when used in oilfield service industry, industrial service industry and especially in environmentally sensitive areas. This type of centrifuge is high in recovery rate, effective in solids control and remarkable in the reduction of cost spent on drilling mud resupplying and management. Of course, the whole equipment must be mounted on the top of drilling mud tank, which is a kind of basic equipment for both solid control system and drilling waste management (vertical cutting dryer is the core equipment for this system), but it is a kind of powerful equipment. Shaker Screen consists of a frame that can either be of steel or plastic, into which mesh can be fitted. This mesh does the work of separating the mixture of solid and drilling fluid. A binding material is used to bind the mesh with the frame. For maximum efficiency, Shaker Screen must be used properly. Following points describe how to properly use it. – The cloth that is used for making the mesh must be of good quality. Also, if the layering of the mesh is increased, the efficiency of the screen will automatically increase and the fineness of the mesh will also increase. – Methods must be implemented to increase the life of the screen. For this the first method is to have a very strong screen so that the meshes are supported very firmly. The second method is to provide proper tensioning to the screen. – The screen must be protected from over tensioning or under tensioning. – When not in use, the screens must be properly removed from the machine, cleaned and stored properly. Extra care must be taken while storing the screen. – Also, when the screen in being installed, care must be taken that they are not mishandled. Mishandling of the screen, especially during installation may cause extra wear and tear. – The weight of the mixture that is being fed to the screen must be in accordance to the amount of weight that the screen can handle. Different types of screens are available for various sizes of the mixture. – The screens must be cleaned frequently and carefully. Care that must be taken during cleaning the screen is, the water that is being used is not of very high pressure or else it may cause the mesh to unbind from the frame. KOSUN will supply better goods and services to customers continually. Shale shaker is a very important equipment that is used in the first stage separation of drilling liquids and the solid materials obtained from drilling oil, gas or water wells. This shale shaker consists of a shaker screen that does the separation process. 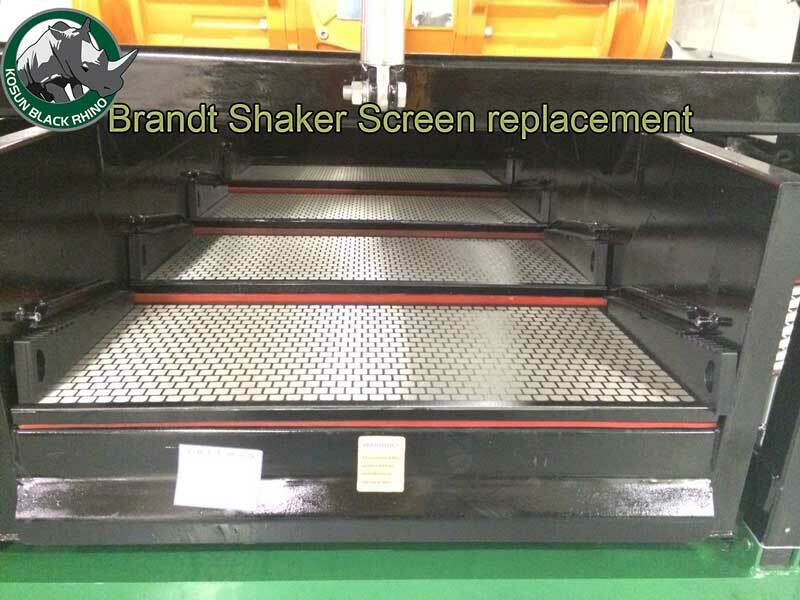 Brandt Shaker Screen comes in various types and different mesh sizes. Its two main types are the hook type and pretension type. Also the amount and the size of the solid that will get separated depends upon the size of the mesh. Because of its importance, it is very important that the shaker screen is cleaned regularly. Cleaning it regularly will increase its efficiency and will delay the wear and tear of the mesh. – This methodology involves the use of small folded or creased wires. – These wires are arranged on a surface in such a way that small gaps are created resulting in a mesh like structure. This is usually supported using Support bars so that they are free to vibrate. These vibrations prevent the blocking or jamming of the mesh. – In this method a high pressure water pipe is used that cleans the screen by pouring water on it at a very high speed. This is a very traditional method that cleans the screen when less cleaning is required. – These machines are fully enclosed machines. The screen is placed inside this machine where a powerful water gun, releasing water at a very high pressure, is used that cleans the screen. – The advantage of this machine is that it is fully automatic and no effort is needed at the workers part. – Also this machine reduces the time required for cleaning a screen there by increasing the overall cost effectiveness.